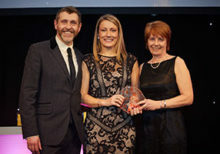 We were named specialist provider of the year at the Tes Further Education Awards. The judges described National Star as ‘an inspiring place’ that puts its learners at the centre of everything it does. National Star is recognised as a national centre of excellence who partners with local authorities and other colleges to help deliver continuing professional development for teachers who support learners with special educational needs and disability. National Star was rated ‘outstanding’ by Ofsted in January 2018, when inspectors said senior leaders and managers had ‘successfully sustained the culture of high standards’ while teachers, learning support assistants and other staff ‘prepare students for adult life very effectively and, consequently, the quality of their lives improves’. Through a destination-led focus, National Star gives students autonomy, asking them what they want to achieve and then putting the necessary steps in place to help them achieve their goals. We have enjoyed a high profile on the national stage, with learners regularly making media appearances and challenging perceptions about people with learning difficulties or disabilities. This has included appearances before the Commons Education Select Committee. Through the college we provide a wide range of personal development and vocational courses, ranging from pre-entry to level 2, for 119 residential and 112 day students. In 2018, we hosted FestABLE, the first national conference for specialist education, attracting delegates from all over the UK. National Star also won an AoC (Association of Colleges) Beacon Award at the London prize giving. We received the British Council International Award for our training programme that helped to support teachers across Europe to develop a more inclusive approach to their teaching. We work with learners who traditionally do not have the opportunities to work through international collaboration due to the level and range of their disabilities. The project has enabled Greek and UK learners to develop employability skills through working in social enterprises and enabled Greek teachers to work with UK job mentors to improve their professional practice within employment support services. David Ellis, Chief Executive of National Star, said the awards were testament to the commitment of the charity’s 1,000 staff. ‘The outstanding work that our staff all do – at every level – has enabled the charity to be recognised in this way,’ he said. Find out why we received these prestigious awards by exploring our range of exceptional full and part-time, residential and day learning programmes.